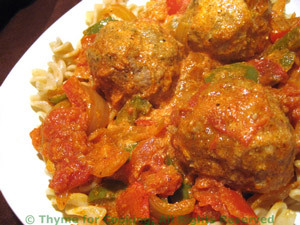 Pasta with Meatballs in Paprika Sauce, Thyme for Cooking. A variation on the traditional Chicken Paprikas, this uses small, spicy meatballs. Open and drain tomatoes, reserving juice. In large skillet heat the oil over medium heat. Add the paprika, chili powder, and sauté for 10 seconds. Add the tomatoes and juices, heat to simmering. Put pasta in large serving bowl, spoon meatballs over and serve.